They are done, and here they are. 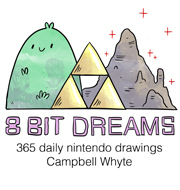 I have compiled the first years worth of 8 Bit Dreams illustrations in to one slide show, for your viewing pleasure. 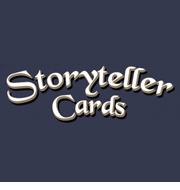 I mentioned in an earlier post that I have chosen to put the project on hold because I’ve been offered to opportunity to work on my graphic novel that I’ve been developing for a few years now. When I started the 8 Bit Dreams project, I thought it would just be a small side project, that I could do without interfering with all my other work. I was very wrong. It would up consuming nearly all of my creative time during the year. Each illustration took about an hour to complete, including researching the game. Then there was scanning, cleaning up, resizing, uploading, posting, listing on etsy. All of these “little” parts add up to a lot of time. I’d like to thank all of the people who shared my project with their friends, it’s great encouragement to see site hits rise, to see that people are paying attention. Thanks to all those who purchased work, and commissioned custom illustrations. It made it easy to justify to my family why I was doing this when money was coming in to pay the rent or buy groceries. It’s easier to take pride in your work when you can see how it is helping provide your basic needs. Thanks to my partner for putting up with me during this ridiculous endeavour, her support was invaluable. For now, many of the illustrations are still available to purchase on my etsy store, head over there to see if the one you like is still available. The greatest thing you could do would be to share the video with friends, or purchase a work. That’d mean the world to me. In the future, I’d love to exhibit the illustrations, so if any galleries are reading this, this might be your opportunity! Lots of people have suggested I publish them in a book, I’ve looked at print on demand options, and right now that’s not really looking too feasible an option. I might need to look in to a few different possibilities. If any publishers want to pick it up, I’d love to hear from you too. Music for the video was provided by the wonderful Surasshu. Head over to his site for more incredible tunes. You can follow me on twitter for even more updates, sketches and news. what’s your name in the etsy store can’t find you. Thanks Alanna, glad you like them. good job you doodle better than you spell. Ooop, I’ll start writing my lines. That’s a pretty good idea. I’ll have to research the costs of small print runs.